Phrases such as “unsustainable allocation rate” and “you need to keep your allocation rates low” seem to belong to the vocabulary of Java Champions alone. Complex, scary and surrounded by magic aura. As it often happens, the magic disappears with a puff of smoke when you look at the concepts more closely. This post is trying to remove the magic from the mentioned terms. What is allocation rate and why should I care? Allocation rate is measured in the amount of memory allocated per time unit. Often it is expressed in MB/sec, but you can use PB/per year if you feel like it. So that is all there is – no magic, just the amount of memory you allocate in your Java code measured over a period of time. Knowing this fact alone is not too beneficial though. If you can bear with me I will walk you through the practical use of the concept. Facing high allocation rate can mean trouble for your application’s performance. From the practical standpoint, the impact is surfaced by Garbage Collection becoming a bottleneck. From the hardware standpoint, even commodity hardware can sustain several GB/sec of allocations per core, so in case your rates do not start exceeding 1 GB/sec/core, you can be rather comfortable that your hardware will not actually be the bottleneck. So, when focusing on the GC, we can start with an analogy that is also true in the real world – if you create a lot of stuff, you tend to face a lot of cleaning afterwards. Knowing that the JVM is built with a garbage collecting mechanism, need to look into how allocation rate changes the frequency or duration of the GC pauses. At 291ms after the JVM was launched 33,280K of objects were created. First minor GC event cleaned the Young generation, after which there was 5,088K of objects in the Young generation left. At 446ms after launch, the Young gen occupancy had grown to 38,368K triggering next GC, which managed to reduce the Young Gen occupancy to 5,120K. At 829ms after the launch, Young gen size was 71,680K and the GC reduced it again to 5,120K. Having this information allows us to say that this particular piece of software had the allocation rate of 161 MB/sec during the period of measurement. Now, being equipped with this information we can understand how the changes in allocation rate affect application throughput by increasing or reducing the frequency of GC pauses. First and foremost, you should notice that only Minor GC pauses cleaning the Young Generation are affected. The frequency nor duration of the GC pauses cleaning the Old Generation is not directly impacted by allocation rate, but instead by promotion rate, a term that we will cover in our next post. Knowing that we can focus only on Minor GC pauses, we should next look into the different memory pools inside the Young Generation. As the allocation takes place in Eden, we can immediately look into how sizing the Eden can impact the allocation rate. So we can have a hypothesis that increasing the size of Eden will reduce the frequency of minor GC pauses and thus allow the application to sustain faster allocation rates. 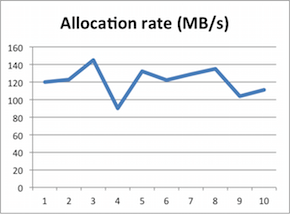 Increasing Eden size to 1GB, increases the allocation rate to just below 200MB/sec. If you are still wondering why this can be true – if you stop your application threads for GC less frequently you can do more useful work. More useful work also happens to create more objects, thus supporting the increased allocation rate. Now, before you jump to conclusion that “bigger Eden is better”, you should notice that allocation rate might and probably does not directly correlate to the actual throughput of your application. It is a technical measurement, contributing to throughput. Allocation rate can and will have an impact on how frequently your Minor GC pauses stop application threads, but to see the overall impact, you need to take into account also Major GC pauses and measure throughput not in MB/sec but in business operations your application provides. 1. Facing high allocation rate can mean trouble for your application’s performance. 2. Increasing Eden size to 1GB, increases the allocation rate to just below 200MB/sec.if you stop your application threads for GC less frequently you can do more useful work. More useful work also happens to create more objects, thus supporting the increased allocation rate. There are two concepts that are slightly confused here. First of them is the amount of memory that the application attempts to allocate per a time unit. The higher this amount is, the greater GC pressure the application faces. If the GC cannot cope with it, then the effective allocation rate is actually decreased. The application tries to allocate 200MB/sec, but due to GC pauses, it is only able to allocate 100MB/sec, and therefore is not at peak performance. Increasing the Young generation size gives the application more room to keep its short-living objects, and thus the GC pauses are less frequent. As a result, the effective allocation rate increases, and the application performs better. I hope this makes it clear to you.